The Willow Bay Theater offers the best in entertainment and events that Jamestown has to offer, in an intimate, family-oriented setting. Public events include live music that spans the genres of Folk, Rock, Pop, Contemporary, and Christian. Also, many other types of live performance events occur in the theater on an annual basis such as Plays, Musicals, Dinner Theater, Illusionists and Stand-up Comedy. The Willow Bay Theater is available to rent for any private event you may be orchestrating. 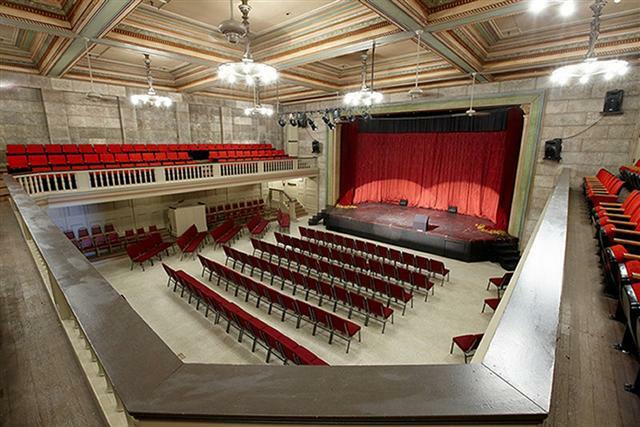 This classic venue has been retrofitted from a Masonic Temple when it was constructed in 1921 to a modern theater space, and while maintaining its ornate qualities and its historic feel, this venue is equipped to put on a contemporary event. With its ability to adapt to almost any form, this space makes the perfect spot for your next birthday party, reception, wedding, anniversary, or perhaps a business seminar.